Posted schematics, pictures and brief instructions for connecting MIDI input and output to DS to the DSerial Wiki. MIDI output is very easy, because it requires no components besides wire and a 5-pin DIN connector. MIDI input, on the other hand, requires a 3.3V optocoupler because MIDI uses a current loop to prevent introduction of noise. The setup consists of open RoboDS prototype and DSerial2, 3 cameras, an old computer acting as a camera server and my webhost. One camera is a Canon PowerShot A70 and provides periodic photos uploaded via FTP. Second camera is Logitech webcam, it provides top view video stream to the driver. Third camera is a wireless spy camera attached to the bot itself. It provides first-person view to the driver. The web interface uses AJAX with a PHP back-end to control the bot as well as to control the queue of people. Main concerns were the number of people and security. I cannot host all the people from my home connection, so I can only provide live video stream to the driver. Other people in the queue can see the digicam photos periodically uploaded via FTP. Security was needed so that it wouldn’t be possible to cut in line or view the live video stream or control the bot despite not being in the driver position. Most of the schematics are available at NaWiki. A hi-def assembly video will be posted soon. Special thanks to my brother Ivan (Xploder) for Flash code as well as part of the PHP code. DSerial2 and RoboDS kits are now available for pre-orders. DSerial is an adaptor for Slot-1 with a couple of different ports available: GPIO, UART, RS-232, USB client, ADC and PWM. 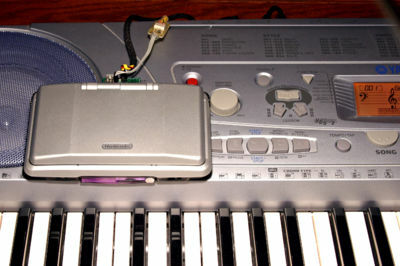 This allows to connect NDS to devices like MIDI keyboards, computers, GPS receivers, keyboards, R/C servos, sensors, anything with a serial port and more. The firmware for DSerial is open-source and can be reprogrammed on-the-fly from DS if needed for a particular program. RoboDS is an open robotic platform for the DS. It runs a minimal HTTP server and can be remotely controlled via NDS Wi-Fi. It is very simple to construct as it uses 3 equal servos (2 of them are modified for continuous rotation). Sensors can be added as needed and connected to DSerial2. I will post a hi-def assembly video shortly. You are currently browsing the Weblog weblog archives for March, 2007.